The Supervisor of Assessments’ Office is responsible for maintaining ownership records on all property located in the county. This is accomplished through reviewing documents recorded in the office of the Livingston County Recorder of Deeds to determine if a property is transferred, partitioned, annexed or detached. If a property is transferred, the tax rolls are updated to reflect the new owner and billing address. The mapping company is notified of any partitioned property to create new parcel numbers to correspond with the new legal description(s). Any annexed or detached parcels must be recorded so that tax rolls can be updated to reflect changes in parcel numbers, legal descriptions, taxing districts, exemptions, and billing addresses. The Supervisor of Assessments compiles all sales data on properties, which is sent to the State of Illinois Department of Revenue as well as local assessing officials. By State law, the local assessing officials are to assess residential, commercial and industrial properties at 33 1/3% of its market value as of January 1 of the assessment year. Farmland assessments are based on the soil’s ability to produce a crop. These assessed values are certified by the State Technical Advisory Committee each year. Farm buildings are assessed according to contribution to the farm. The Supervisor of Assessments is appointed by the County Board for a four-year term. 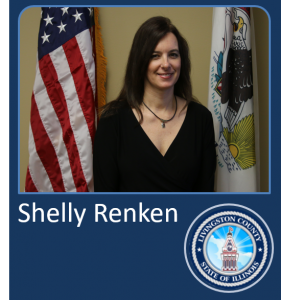 Shelly Renken assumed the position December 22, 2015 and is assisted by four full-time deputies. Nine assessors, two township assessors and seven multi-township assessors, are elected by the people for four-year terms. The Supervisor of Assessments must be a Certified Illinois Assessing Official and must maintain that certification with thirty hours of successful class work each year. In order for the county to be reimbursed one-half of the Supervisor’s salary by the State, the law requires that the residential, commercial, and industrial property must be assessed between 31 1/3% and 35 1/3% level of assessments on average. The Supervisor of Assessments’ Office administers all real property tax exemptions. Non-homestead exemptions are for property owned by governmental entities and religious institutions. The primary authority for approving these exemptions is the Department of Revenue. Homestead exemptions are for taxpayers who own and live in the property. The Owner-Occupied exemption is for anyone of any age who owns and lives in the property as of January 1 of the assessment year. This exemption may be up to $6,000 off the assessed value prior to computation of taxes per year. The Senior Citizens Homestead Exemption is a $5,000 deduction from the assessed value prior to the computation of the taxes. The owner must be 65 years of age or older to qualify. The Senior Citizens Assessment Freeze Homestead Exemption is for senior citizens who own and live in their home and have a total household income of $65,000 or less. The Homestead Improvement Exemption exempts the increase in assessed value attributed to an improvement to the residential portion of the property.